[prMac.com] Richmond, VA - Like Thought is proud to announce Opacity 1.3, a major update to their screen graphics editor. This update adds an improved Pen Tool, improved Text editing, and several other new features that makes Opacity even better for designers. Opacity Express 1.3 is also available with the core features of Opacity 1.3 at a more affordable price. The new Pen Tool options in Opacity 1.3 makes it easy to draw any kind of shape. It's also now possible to fully edit a Pen vector after it has been created. A new Scissors Tool can be used to cut Pen vectors into multiple pieces. With the brand new Spiral Tool, it's easy for designers to create sophisticated images in Opacity. Strokes on vectors now have many new options as well. They can now be inside or outside of a path instead of just centered on it, and they can draw a gradient or image instead of just a solid color. In Opacity, vectors can also now have more than one stroke, which allows for many interesting new graphical effects. It's also much easier to edit Text with an improved Text editing inspector that includes the text's font, color, style, alignment, kerning, and more. Finally, an improvement to the Opacity file format allows for smaller file sizes and faster saving of Opacity documents. Opacity streamlines the image creation workflow by combining a great vector editor and pixel editor with native support for all the formats needed for screen graphics. Vectors make it easy to draw great looking graphics and easily make images ready for resolution independence. Opacity has traditional graphical features like layers, filters and transforms along with exclusive features including variables, templates, factories and much more. By leveraging the power of Core Animation and Quartz, Opacity combines all of the tools artists need to create beautiful images for icons, applications and the web. Opacity and Opacity Express require Mac OS X 10.5.6 Leopard and are Universal Binaries for PowerPC and Intel Macs. Free trial versions are available for download. A license for Opacity Express costs $39.99 (USD), and a license for Opacity costs $89.99 USD (an Opacity Express license can be upgraded to an Opacity license for $50.00 USD). 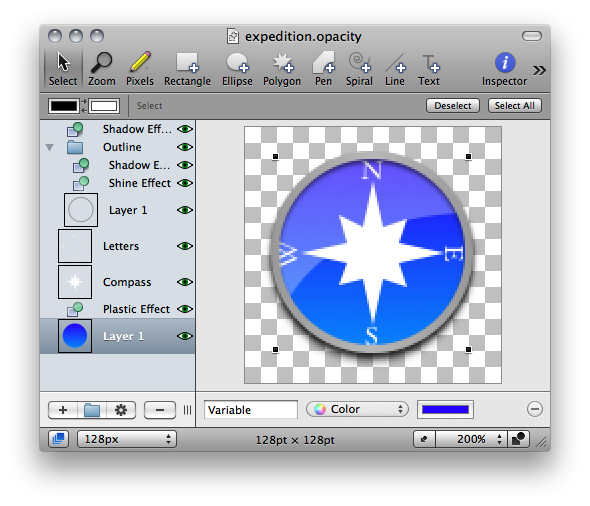 The 1.3 update is available for free for all existing Opacity and Opacity Express users. Like Thought is a small independent Mac software company. It was founded in 2006 by Jacob Godwin-Jones in Williamsburg, VA. Like Thought has released Lexicon- a language learning application for the Mac, iPhone, and iPod Touch. The company has also released Opacity- a professional editor for screen graphics- and Opacity Express- an easy to use, affordable screen graphics editor. Like Thought also released Golden Handbell, a fun music game exclusively for the iPhone and iPod Touch. Like Thought is dedicated to making high quality, user friendly applications for the Mac and iPhone, and is also available for iPhone and Mac consulting.